Do you remember comfort foods from your childhood? This soup is that for me. It was a popular dish for working mothers in my kampung because it was quick to make and oh-so-easy to get kids to finish their meals off. Fast forward today, it's something I hardly make as my preferences lean toward clear soups. However, I don't want to lose my roots completely. 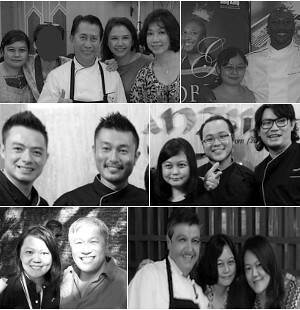 So, here it is on my blog today. I add quite a bit of white pepper to make it peppery. This is because I love a little spice in my soup. It's a personal preference. 1) Heat oil in wok. Saute garlic until lightly browned. 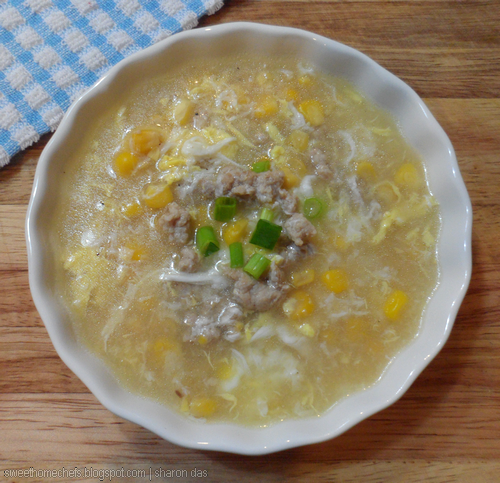 2) Add minced pork, along with ½ cup water. Stir furiously (to keep the meat from lumping up). 3) Then, add both the corn and remaining water. Wait for it to come to a boil. 4) Once it's boiling, season with salt and pepper. 5) Stir the eggs in, then switch the fire off. 6) Serve garnished with spring onion. Best eaten with white rice or on its own, as a starter. 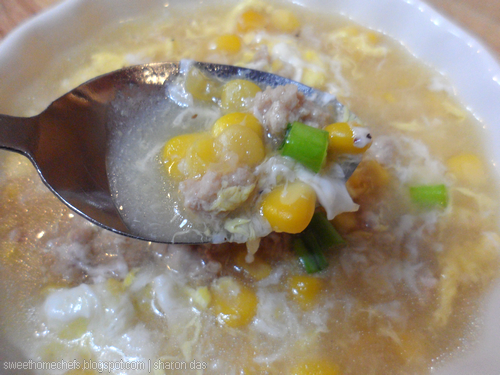 1) Garlic, Corn, Minced Pork, Egg. 2) Cook the pork. 3) Add water and corn. 4) Flavour and add the egg. 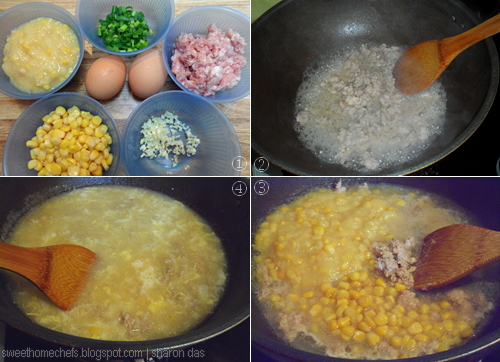 The easy way of doing this soup : Add water into a soup pot, along with the corn. Stir to combine. Then, wait for it to boil. Stir the minced pork in. Once it's cooked, season with salt and white pepper. Finally, stir the egg in. That's it! I like peppery soups..esp. at this time of year. Your soup looks very tasty, Sharon. We are heading towards cooler weather and this soup is certainly on my list, Sharon. Everything tastes better when the weather is kinder. :) Looks very delicious! Oh, that's nice! :D We're still bogged down with the haze - it's gloomy skies and unhealthy air for us until things improve. 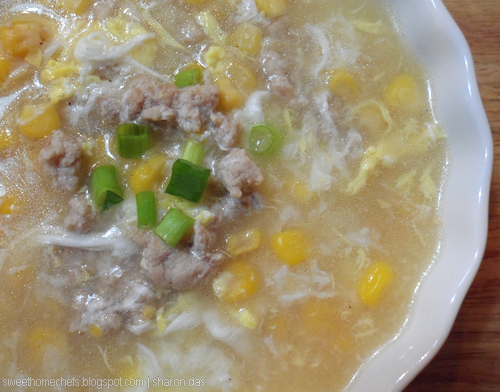 I love corn soup so much! This is very mouth watering. I'm craving rigth now.